New Show: Magnificent Monster Circus! We are very excited to announce our new show, Magnificent Monster Circus! CactusHead Puppets presents a Circus like no other! Join in as the Monsters’ Caretaker guides you through the world of monsters. Enjoy the Thrills of the Clarissa the Crested Cannon! Experience the Chills of Eustace the Uni-Browed, Uni-cycling, Uni-monster as he tackles the Sinister Snake Slack-rope! All this and more in The Magnificent Monster Circus! 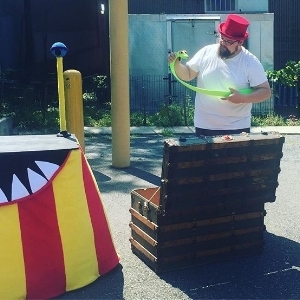 We’ve been working on this show little bits at a time since last fall, and were thrilled to receive support from the Somerville Arts Council through the Puppet Palooza New Works program to help us expand and develop it further this spring and summer. Monster Circus can be performed BOTH indoors or outdoors, and has lots of great interactive moments for the audience! Its been lots of fun trying things out with audiences in rehearsal, and we’re excited to have the show on the road now. If you follow us on Instagram, you have probably seen progress photos from the show, but here are a few highlights from the building and rehearsal process. Looking forward to sharing our Magnificent Monster Circus with lots of audiences! CactusHead Puppets on Mass Appeal! We were excited to be invited to appear on WWLP's Mass Appeal on Monday 3/27! We talked a little about different kinds of puppets, and showed how you can make a simple hand puppet at home. You can check out the clip here. CactusHead Puppets at Ashford School! We are very excited to be hosting a puppet slam at Gateway City Arts in Holyoke, MA on April 16th! Puppet slams are performances of short-form puppet pieces for an adult audience. They are a great chance to see lots of different styles of puppetry, and different puppeteers, all in one evening. More info about our slam will come soon, but here are the basics so you can save the date! The Holyoke Canal District Winter Festival is 2/12- 2/14, and there are lots of great activities for the whole family all through the weekend! Check out the full schedule of events here. We'll be at the Artisan Market on Sat. 2/13, and will perform a few short pop-up shows through out the day while we're there! Hope you are able to come out and see us, and enjoy this great community event! We are performing Just So Stories at The Eric Carle Museum of Picture Book Art this coming weekend on 1/2 and 1/3. Here are the details, hope you are able to join us! Call 413-658-1126 to purchase tickets. Want to come to a CactusHead Puppets show? Here is a list of our upcoming public performances! Some libraries request that you preregister, so it is best to contact the library for details. We will add more dates as shows are booked, so check back to see if there is a show near you soon. Pied Piper is returning to the Puppet Showplace Theater! We are excited to be heading back to the Puppet Showplace Theater in September to perform The Pied Piper of Hamelin! Shows will be 1pm & 3pm on Sept. 12th and 13th, you can get tickets and more info on the Showplace's website here. The town of Hamelin has a rat problem, and there's only one person who can help! CactusHead Puppets brings the story of the Pied Piper to life with a cast of colorful characters in this comedic adaptation of the traditional folktale. Not only does the town find a musical solution to pest control, but the kids of Hamelin also teach the grownups a lesson about generosity. In the end, the townspeople all come together in celebration. This production features multiple puppetry styles, a silly hat contest, and plenty of dancing rats! Little Red Riding Hood and Pied Piper Performances this Week! We are excited to have several shows this week! - Note: There is an error on the museum website calendar that lists our performance as 7/30, but it is on 7/29. Little Red Riding Hood's anxious mother sends her off into the woods with some treats for her dear old grandmother, but to get home safely she and her grandmother will have to outsmart the Big Bad Wolf. Are Little Red and Grandmother in trouble, or has the wolf bitten off more than he can chew? Join CactusHead Puppets for their modern adaptation of this classic story, told with hand puppets and shadow puppets. Tickets $5, call 413-658-1126 to purchase. The town of Hamelin has a rat problem, and there's only one person who can help! CactusHead Puppets bring the story of the Pied Piper to life with a cast of colorful characters in this comedic adaptation of the traditional folktale. Not only does the town find a musical solution to pest control, but the kids of Hamelin also teach the grownups a lesson about generosity. In the end, the townspeople all come together in celebration. Join puppeteers John and Megan Regan as they present this classic tale, told with multiple puppetry styles, and plenty of dancing rats! This is a list of our shows that are currently available for bookings. Workshops can also be offered to go along with the shows if desired. Please contact us at cactusheadpuppets@gmail.com for more information. Show length- 40 min. with optional Q&A after the show. Show length- 25 minutes with optional Q&A after the show. Show length - 30 min with optional Q&A after the show. Show Length- 35 minutes with optional Q&A after the show. Fashion is the most important thing to the Emperor, even more than taking care of his own kingdom. When two strangers come to town promising the most beautiful clothes anyone has ever seen, the Emperors learns a lesson in fashion he will never forget. Show Length- 30 minutes with optional Q&A after the show. We have two performances of Little Red Riding Hood at The Eric Carle Museum of Picture Book Art coming up during MA school vacation week on April 21st! Show times are 11am and 2pm on the 21st. Tickets are $5 each, and can be purchased over the phone at 413-658-1126. Hope you can join us for this fun show! Want to come see a CactusHead Puppets show? Check out our list of public performance dates to see if there is a show near you! Interested in having us come perform at your location? Check out the list of touring shows we offer here, and email cactusheadpuppets@gmail.com for info about availability and pricing. The show is also now available for touring! We've got a few dates already lined up (more info on those soon), and you can contact us at cactusheadpuppets@gmail.com if you are interested in having us come do a show. There are a several opportunities to see CactusHead shows coming up! Tickets may be purchased in advance at the Museum Admissions Desk or by calling 413.658.1126. Hope you are able to join us for these shows! Upcoming Shows and Booking for Fall! It's hard to believe it's already September, but we have lots of exciting things coming up to look forward to! Saturday, 9/13 we will be performing The Tale of Juan Bobo at the Springfield Museums as part of their LittleFest. Our shows will be at 11:30 and 1:45, and a schedule of all the great events that day can be found here. It looks like all the events are included in museum admission that day, and if you are Springfield resident, WGBY, or Springfield Museum member, its free! We are also now booking for shows for the fall and winter! If you would like to have us come and perform at your location, please email cacusheadpuppets@gmail.com for info about pricing and availability. You can choose from any of our touring shows, and we also offer puppet making workshops that can stand alone or be booked along with a show. You can learn more about all the shows we offer here. The last bit of news is that for our next new show, we are actually remaking our first show, The Pied Piper of Hamelin! It will be a little longer, have more scenery, more puppets, and of course more RATS! The show will premiere in Jan. 2015 at the Puppet Showplace Theater in Brookline, MA and then be available to tour. Check back here soon for more info about how we are creating this new and improved show. You can order tickets by phone at (413) 658-1126. We are booking now for the summer! Our newest show, The Bremen Town Musicians, is available for touring along with all other titles. More info can be found here. Contact us at cactusheadpuppets@gmail.com if you are interested in having us come do a show at your location this summer. We also offer puppet making workshops that are a great summer camp activity. We have a few public performances already lined up, so keep these dates in mind if you'd like to come see a show this summer. Our new show, The Bremen Town Musicians, opened today! We had two great audiences today, and we have six more performances this week if you'd like to come and see the show. Its a fun show that uses both shadow and rod puppets, and it's full of singing and dancing animals! As a little preview, here are some pictures from the show. Order tickets by phone at 413-658-1126. Our new show, The Bremen Town Musicians, opens next week. Its going to be a really fun show, and seeing some puppet theater is a great way to spend a day during spring break! We are using both shadow puppets and rod puppets in this show, and have some quick pictures of the rod puppets to share. Check back for more pictures from the show soon, including the shadow puppets. Hope to see you at one of the shows!